Adleg, Warden of Oryx is a unique Taken Knight encountered in a special version of The Sunless Cell Strike. The player Guardian must kill him, and then Alak-Hul, the Darkblade within thirty seconds, in order to seal the Sol Edge. The Exotic Sword Raze-Lighter is awarded after. 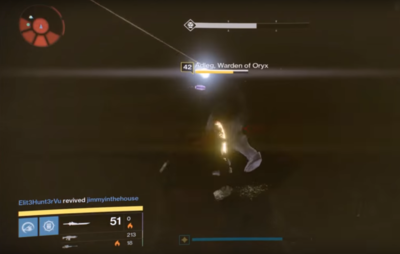 Adleg will spawn during the fight along with Heolstor, Warden of Oryx and Thracu, Warden of Oryx. In order to complete the requirements, Alak-Hul must be killed within 30 seconds of Adleg, the other two Knights can be killed at any point, providing a member of the fireteam does not need them for their own Sword. Once the other two are dead, and and Alak-Hul's health is brought down very low, it is best to bring them close together and bring Adleg down then quickly switch the the Darkblade and unload any high damage offensives. Adleg sounds similar to the name of Alfred Adler, a doctor originating from the 19th to 20th centuries.